Visibility has become a synonym for representativeness in the digital era. This is a tricky idea and maps make us think that what we see in them IS the visible world, and not just A representation of it. “Mapping the DH” sounds like a pretentious title: it is. This is not an exhaustive study, but a practical list of the projects I know have tried to offer a snapshot of different attempts to visualize the geolocation of the field. Another useful half mapping / half info-graphic is Melissa Terra’s “Quantifying Digital Humanities“, which offers a quick view of the state of art of DH’s in 2011, and it would be cool to have a new edition of this taking the considerations above in mind. This is a great compilation of DH centers, and very illustrative of where DH is in 2014. 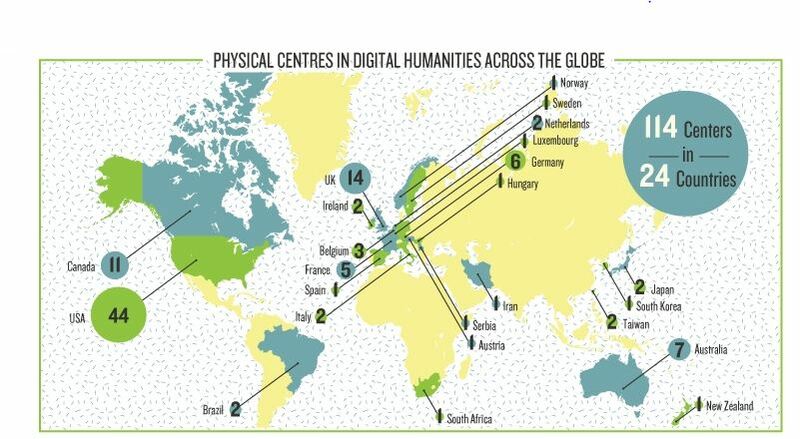 Does this post only reflect groups with the phrase ‘digital humanities’ in the name? or, in other words, how does something ‘count’ as a DH center? Dear Heather, first of all, thank you so much for taking the time of reading this post and leaving me a comment. About your question, I think I don’t quite understand what you mean. This is a recompilation of many maps I didn’t do myself, and all of them had different strategies, the only two that actually map the “DH-centers” are CenterNet and Melissa Terra’s “Quantifying…”. As for the ones I did, I can say MapaHD is the cartography of the self-reported Spanish and Portuguese DH’ers, the map for Defining DH is of the author’s affiliations and the one with the Spanish DH events is of the ones mentioned by the two posts I quote.